The 2019 edition of the International Lidar Mapping Forum is a wrap. The folks at Diversified Communications provided a booth (thank you! ), which gave me the opportunity to hang out and chat with a bunch of interesting folks for the better part of three days. There were experts in algorithms and leaders of companies coming up with new ways to use lidar on self-driving cars over forests, in cities, and along our coasts; there were drone pilots and specialists in inertial navigation systems and much more. 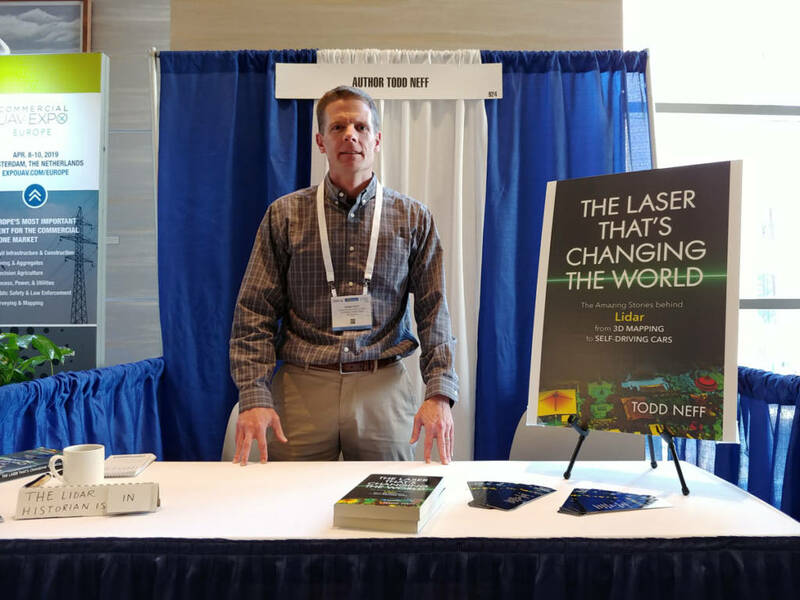 It was gratifying to have people say they’ve enjoyed “The Laser That’s Changing the World” and, in a few cases, even buy it (I had brought a few copies along, though I considered myself part of the entertainment program). I had the chance to finally meet face-to-face people like Sean Higgins (SPAR 3D‘s editor), Stewart Walker (Lidar Magazine‘s editor) and Gene Roe (Lidar News‘s editor). A special bonus was a reunion with Myrna James Yoo, who edits and publishes Apogeo Spatial. Myrna worked at Front Range TechBiz, where, until it shuttered in late 2002, I had my first true journalism job. I said many times that the book’s title struck me at first as hyperbolic, but that it’s ultimately true — and will become ever truer as self-driving cars with lidar increasingly take to the roads. Todd Neff writes from Denver, Colorado.